February 9th, 16th and 23rd. A portable weaving technique! If you love weaving, but can’t take it everywhere, try this! 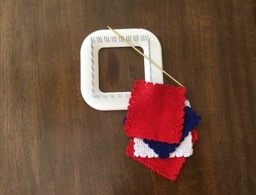 Make squares, seam them together – sew, crochet, etc. In class. We will make a basic square, then we’ll branch out into patterned squares. We’ll also seam our squares together. I love pin loom weaving – Not only can you make patterns within the square, you can applique on top of the square.